PARIS — The streets around the Champs Élysées Avenue in western Paris were brimming with French citizens and tourists watching the Bastille Day parade early Friday. Some had woken up in the middle of the night to travel to the capital for the spectacle, others had come to watch family members, while others had come just to catch a glimpse of U.S. President Donald Trump. The president attended the event as French President Emmanuel Macron’s guest of honor. This year’s Bastille Day parade has dual symbolism: Not only does it celebrate July 14, France’s most important holiday, marking the storming of the Bastille prison in 1789, which helped spark the French Revolution. It also commemorates the 100th anniversary of the United States' entry into World War I. The two leaders looked on as U.S. and French troops march side by side down the grand avenue. “We came here for Donald Trump,” said Sylvain Martel, 40, who had woken his family up at 3 a.m. local time (9 p.m. ET) to drive to the parade in Paris from Nancy, some 4.5 hours to the east. “He’s the most powerful man in the world and we’re happy he’s here to celebrate July 14." Fréderic Audes, who had also come to the parade with his family, agreed that it was a good thing that Trump was taking part in the national holiday. “This year the parade has double the symbolism and it shows there is still a strong link between France and the United States,” said Audes, who had traveled into town from the Paris suburbs. Some 190 troops from the U.S. Army, Navy and Air Force were set to march in the parade Friday, with American planes contributing to the grand fly-over, according to Reuters. Thousands of French servicemen and women are also taking part. 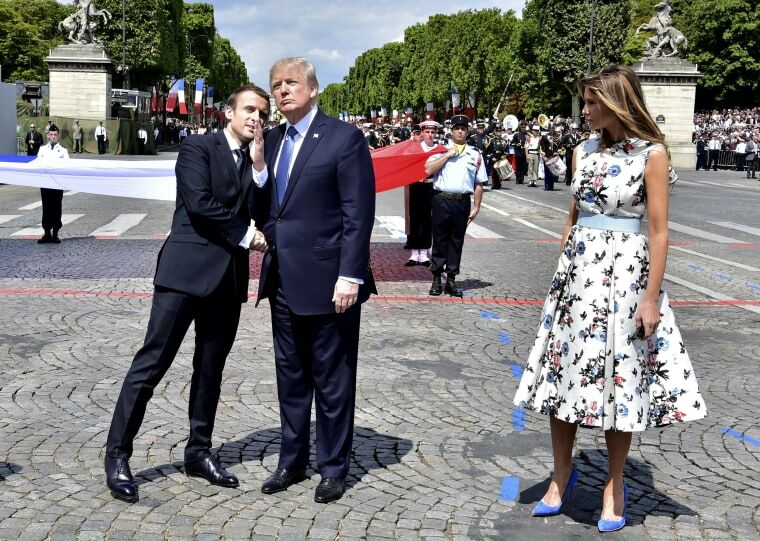 The troops included members of the U.S. Army’s 1st Infantry Division, which was founded in 1917, the same year that the United States entered World War I.
Angie Dragt, a tourist from the Bay area in California, who was visiting Paris with her family, said she was proud that Trump was partaking in the parade. “Everyone is so busy fighting, there is so much negativity, when what we should be doing is what Donald Trump and the French President are doing: laying everything down, being friends, being kind and celebrating the bonds that unite us,” she said. Others were less impressed with the U.S. president’s presence. Fabrice De Meyer, who had come to see his son march with the French troops, said he was frustrated that Trump was at the parade. “I don’t like his policies and there’s too much security this year because of him," said De Meyer as he strained to get a view. "It’s more difficult to see." Security was tight in the area with police vans strategically placed to block access to side roads leading to the Champs Elysée. In a speech following the parade Macron addressed the nation and thanked the president and First Lady Melania Trump for having attended the festivities. "The United States is one of our friends. Nothing will separate us ever," he said. "The presence at my side of Donald Trump and his wife is a sign of our friendship that travels time. I want to thank them here, thank United States for the choice made over 100 years." In a statement released after the celebrations, Trump said: "The ties between the United States and France stretch back almost as far as our shared history as democratic republics. France is America's first and oldest ally. In 1778 our two countries signed a treaty of friendship and alliance. We have remained joined in common purpose ever since." As the parade drew to a close, Macron was set to fly to Nice to address the city that was struck by a deadly terrorist attack on Bastille Day last year. Meanwhile Trump was due to return to the U.S. just after the parade, and was scheduled to spend the weekend at his Trump National Golf Club in Bedminster, New Jersey, where the U.S. Women's Open is taking place.